The writing on the wall became very apparent last year: 2017 would be the year of video. In almost every marketing predictions post for 2017, video was highlighted as an area that marketers need to incorporate in order to remain competitive. Video offers a great format for telling your story (or more importantly, the story of your customers) and connecting with your target audience. In 2016, eMarketer found that over 60% of brands planned on investing more in video in the next 12 months. That means, competition for audience eyes will only get more competitive as brands begin to figure out what video mix works best for their marketing. Unfortunately, finding the right style and type of video for your brand can often be the toughest step. 2017 has just begun and there are already brands that are crushing it with video content and Instagram is one place to start. 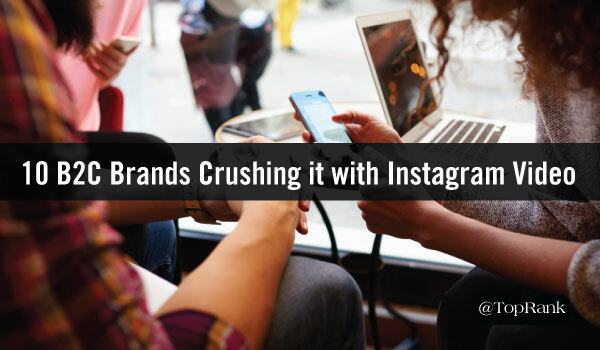 Below we’re going to dive into how 10 B2C brands are winning with 30-60 second video content on Instagram. Oreo has made strides in real-time marketing starting with their infamous approach to the Super Bowl power outage. On their Instagram, you’ll find a delightful mix of Oreos “in the wild” and content focused on classic favorites, as well as new products. In the video below, Oreo asks viewers to “slip into something more elegant” with their new thin cookies. Introducing new Chocolate ?#?OreoThins. Slip into something a little more elegant. RedBull is a brand that is all about adventure and the lives of their super fans. Much of their content is regrams from other profiles as a way to showcase and feature other Instagram’ers. One of my favorite videos that they have published this year is of an adventure loving influencer that takes an exhilarating (albeit short) ride on a rollercoaster down a mountain. Nutella has a very fun and delicious Instagram profile. On it you’ll find different ways to spread Nutella on all of your favorite foods. I particularly enjoy their breakfast videos that showcase different ideas for making Nutella part of a balanced breakfast. They also encourage UGC by using the hashtag #SpreadYourHappy. Stitch Fix is hands down one of my favorite finds within the past two years. Their approach to styling encourages you to step outside of your normal style and experiment with new looks. As part of a style challenge that they’re running on social channels, Stitch Fix is encouraging their customers to upload their favorite looks with videos like the one below to win a $1,000 prize! Put on your favorite playlist, it’s time to pull off athleisure! Hit a #MyStyleChallenge home run like merchandise maven, Rachel B. & try something new! We’ll be announcing the first two winners tomorrow—stay tuned! Contest details at link in bio. Nike is one of those iconic brands that seems to create powerful campaigns, no matter what channel they’re on. This video in particular features professional runners and an olympian in a way that showcases the product, without making it seem like Nike is trying to sell you something (other than an awesome experience). Jimmy Choo is known for their decade spanning high-fashion. What is great about the videos on their Instagram channel is that the products truly look like a piece of art. Their approach makes it easy to consider their fashion an investment versus a splurge and after just one video, I was searching to see how I too could own some Jimmy Choo. Discover the exclusive film that brings the #Women’s #SS17 collection to life on our YouTube channel. Apple Music has a great mix of everything from up-and-coming artists to new tracks from your favorite bands. In particular, their exclusive interview snippets from some of today’s top musicians is a great way to generate excitement and keep people coming back for more. Talking new album, touring and more. Check @teddysphotos & @zanelowe only on @beats1official. Amazon’s Instagram profile is funny, clever and delightful. Each time I visit there is something that warms my heart or makes me giggle. This video in particular gives viewers all the feels. It’s a throwback to the millionth (yes you read that right) banana that they gave away free of charge. #TBT to when we gave out our 1 millionth banana! ??? Life Time Fitness offers a serene and spa like atmosphere in their gyms located throughout the United States. As a long-time member, I have found their social media content to be incredibly motivating. Sort of like that workout pal that keeps you motivated and offers support, even when you’re ready to throw those resolutions out the window. Gerber’s Instagram is exactly what you might expect, pictures and videos of beautiful babies. Gerber is currently on the hunt for their 2017 Spokesbaby and shared video snippets from their 2016 winner which are almost too cute to stand. As these examples show, there are a multitude of options for incorporating video into your content marketing strategy. Everything from motion graphic videos, to stills or interaction with customers all present a great opportunity to begin testing video for your brand. If you’re interested in learning more about TopRank Marketing’s motion graphic video capabilities and how they can help level up your video marketing, contact us today!